Short Review: Several BJJ companies now have budget gis available for the beginner. 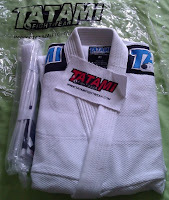 The Nova is Tatami Fightwear's contribution to that market and it's a good one. Lightweight, slim-cut and soft, the Tatami Nova is a strong contender. I'd still recommend a judogi as a first option due to the cheaper price, but as the Nova is £52.50, there isn't a huge difference in the strain on your wallet. Even the shoulder patches come off without leaving much of a trace, which is excellent news for plain-gi obsessives like me. It comes in either white or blue, available to buy from here for a little under $90 (or just over £50 in the UK, from the Tatami website). Update Dec 2016: The equivalent Tatami gi now looks to be their Fundamental option, available here for £58. Full Review: I often have beginners ask me what gi they should buy. 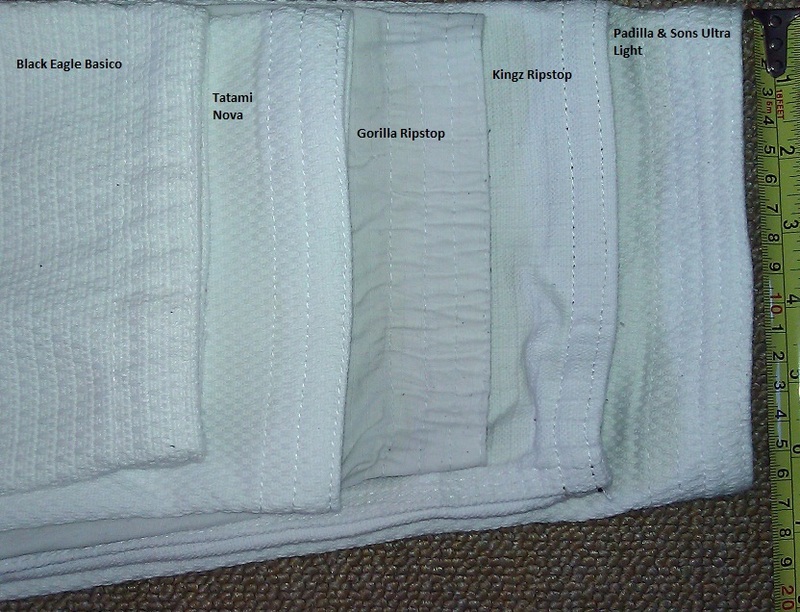 My first recommendation is always a basic judogi, such as my £20 Blitz Kokuba (currently about £30), followed by two budget gis: the Black Eagle Basico and the Tatami Nova. However, up until now, I’ve always had to add the proviso that I haven’t personally tried the Nova. 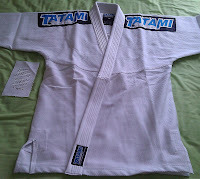 So, I’m pleased to have the opportunity to review Tatami Fightwear’s budget offering, as that means I can give a more informed opinion to those beginners in future. The Nova currently retails at £52.50, making it roughly £10 cheaper than the Basico. Gi companies love giving their weaves new names: Tatami have dubbed the method used for the Nova a 'unique High Tech Weave'. Neologising aside, I like the softer feel of this weave. The 8oz cotton twill trousers also seemed less bulky than normal, but also more comfortable as a result, almost as if I was wearing ripstop. The Basico is possibly a little thicker and coarser, but there isn't much in it. Either way, the thinner construction is a point in the Nova’s favour. I have a preference for lighter gis: less damp in my house, reduced sweat when I'm training and more room in my travel bag. However, I can’t yet vouch for its durability. I’ll update the review a few months down the line if I notice any problems. Update Dec 2012: I've been training in the Nova regularly for seven months now and have not noticed any significant wear and tear. In keeping with other Tatami gis, the trousers are tied with a bungee cord rather than a flat drawstring. I'm still coming round to the idea of a bungee cord, but having used it for some time now with other gis, it's growing on me (though I still prefer the flat drawstring, like on the Basico). There are only two belt loops, which may bother some, though personally I'm not all that bothered by loop quantity as long as there are at least two. In terms of negatives, the bungee cord is excessively long, but you can always cut it to size. With regards to reinforcement, all the usual places are triple-stitched, with double-reinforced knee padding on the trousers (or at least that's what it says on the website: as far as I can tell, that means an extra layer of fabric has been sewn into the trousers from just above the knee down to the lower shin). 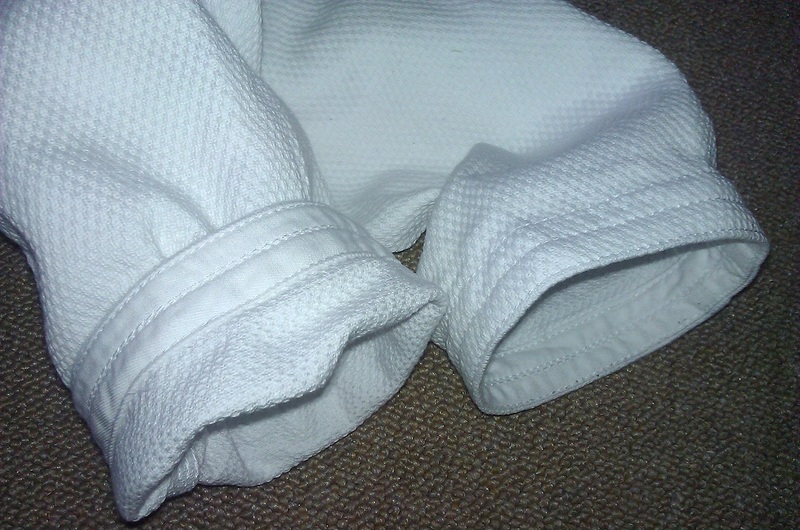 The collar looks to be much the same thickness as the Basico. In common with many other lightweight gis, that collar is made of rubber rather than foam, which means that the website can tout its resistance to bacteria and quick-drying properties. I can't vouch for the former without being a microbiologist, but the latter is true. The Nova dried fast, taking about 12 hours to go from soaking wet to completely dry. 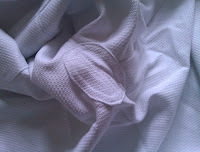 That's while hanging off a clothes horse in a cold English kitchen, with a few hours in the sunshine the next morning. 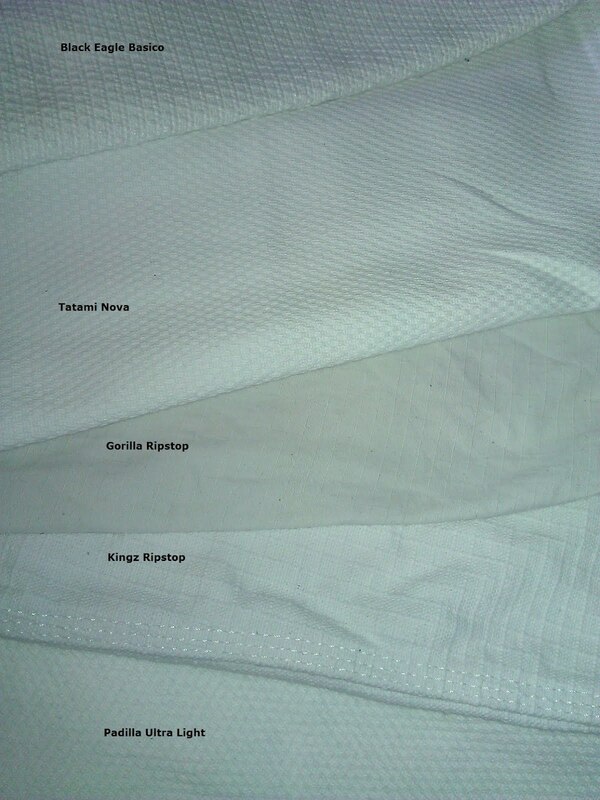 At 425gsm, the weight is comparable to my Kingz Ripstop, though the Nova weave is smoother. I was surprised to see that my Padilla Ultra Light is apparently a bit thinner at 400gsm, according to the website, but the Nova nevertheless feels lighter (possibly also because the skirt on Padilla & Sons products tends to be longer). 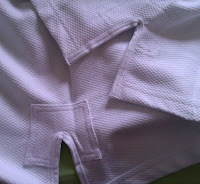 In fact, it feels so light that this is the third best travel gi I currently own, after my Gimono and Gorilla ripstop. The Nova has been perfect for the intro sessions I’ve been teaching at Aro Ling, as that involves about an hour of cycling. When I first started BJJ, I always bought A2, but since then I’ve realised that I prefer a tighter gi. A1 has therefore been my size of choice for the last couple of years. Like the Basico and Predator, the Nova has a form-fitting cut, without lots of fabric left flapping around. Helpfully, Tatami have a swish gi size calculator on their site, which makes it easy to get the right size. Of course, I’ve only tested this for my own frame, but at least in my case it seems to be accurate. Before washing, the Nova jacket was 160cm cuff to cuff. 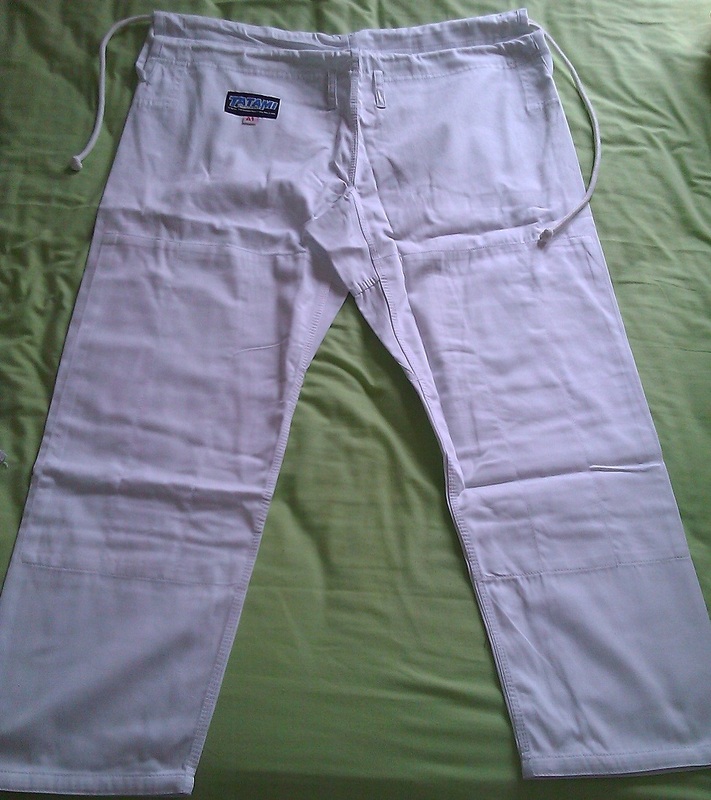 The trousers were slightly longer than I expected, at 97cm long: I had hoped they would be closer to 90cm, as my preference is for gi trousers to stop just above the ankle (probably higher than most people like). After one 30 degrees Celsius wash, the jacket shrank to 157cm cuff to cuff, while the trousers went down to 95cm. That's where it stayed after a second wash. Assuming it doesn’t shrink much more than that, the Nova A1 is a very good fit on my 5'7" and 145lbs/65kg frame. Anybody who has read my gi reviews in the past will know I don’t like patches. 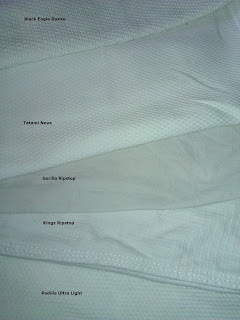 The Tatami Nova is fairly clean, with no embroidery and nothing on the trousers except a small patch. The main bling is in the two shoulder patches, which are also sewn under the collar. There are two rows of stitching, so they are slightly tougher to remove than those on the old Zero G. Having said that, the stubborn sliver of patch which is normally left clinging on under the collar was much smaller than normal. I was able to remove the vast majority of that patch residue with a bit of fiddling. The Nova also comes with a white belt, which isn't always the case with gis. Admittedly, it is a pretty thin belt, so lower quality than the white belt that comes with the Gorilla ripstop, but still better than the Gracie Barra belts (which are the flimsiest I've seen to date). Regardless, it is more than capable of holding your gi closed for a couple of years, which is all you need from a white belt. Bought on their own, the average belt can range from anywhere between £5 to £20 (top of the range belts, like Kataaro and Eosin, are of course much more). If you're a beginner buying your first gi, it is therefore worth factoring that into your price considerations. This looks to be an excellent choice for a beginner. It is slightly more expensive than the judogi I would normally recommend, but only slightly. For that extra £20, you get a better fit, smoother fabric and lighter weight. It's also a potentially good option if you're looking for a travel gi, but can't afford a ripstop gi (I'm only aware of Grab & Pull who do that in the UK, which costs something between £70-80). 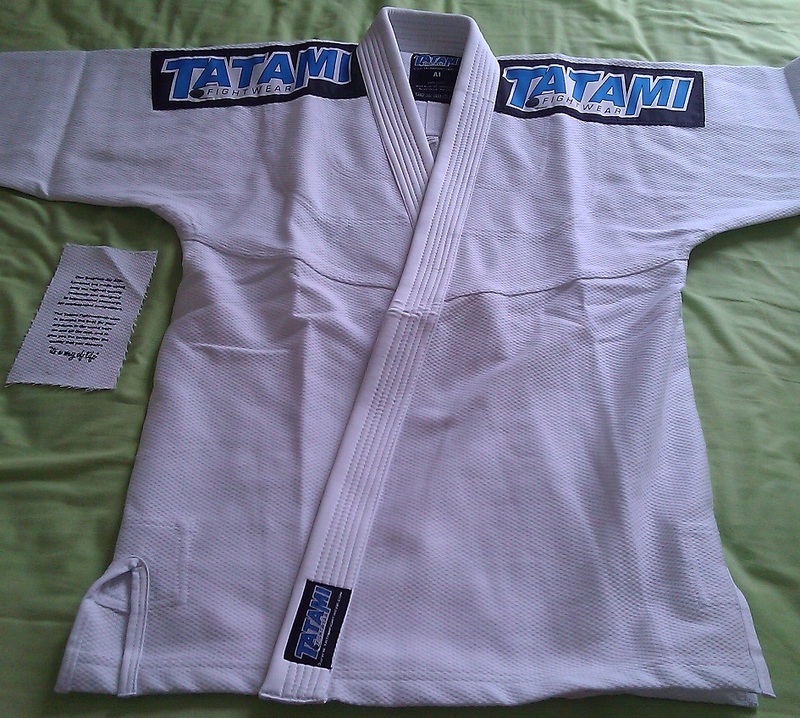 It comes in either white or blue, available to buy from here for a little under $90 (or just over £50 in the UK, from the Tatami website).